Vacuum system to control contaminants in air and on surfaces; supports proper housekeeping procedures and infection control plan. For use in any area housing immunosuppressed, high-risk patients. Collects and contains fungal, biological, lead, mold, asbestos, bacterial, or any other infectious material. HEPA filter is 99.97% efficient at .3 microns,tested in accordance with IEST-RP-CC007 standards. 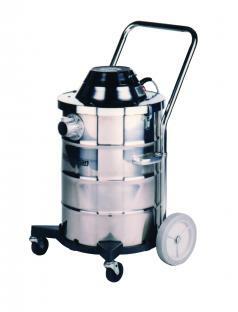 Rugged design, easy to maneuver stainless steel tank with heavy cast aluminum wheel assembly. Patented self-sealing/quick release intake mechanism.